Amazon is expected to unleash its Kindle ebook reader next week. 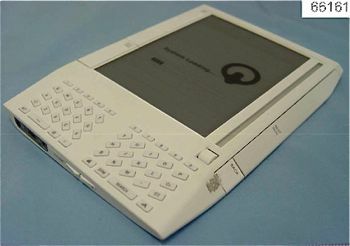 The portable reader is expected to features a 6-inch 800 x 600 pixel display, 256MB internal storage, a mini USB port, 3.5mm headphone jack and an SD slot. The Kindle also is equipped with a Wi-Fi connection that can be used to connect to Amazon for purchasing ebooks, and it’s also expected to offer EVDO wireless data access. Amazon has a tremendous advantage in offering an ebook reader. The company has been digitizing books by the reams for years, so it now has a huge library of copyrighted and public domain content that it could offer on the device. However, it’s likely that the ebook reader needs something else to succeed – support for audio podcasts and some sort of text news podcasting. Without podcast support, the Kindle will be a relatively boring, closed system, like the first-generation Zunes. It will be a Sony Reader on steroids. An interesting gadget. If Amazon embraces podcasting, though, the company could quickly establish the Kindle as a new platform for consumption of Internet content. Users would have access to 100,000+ audio podcasts, on all sorts of topics. And because podcasting can be used to deliver all sorts of payloads, such as PDFs, it could be used with the Kindle to let you subscribe to daily news updates, online magazines and other free Web content. We’ll be watching the Kindle introduction with interest. But, unless it supports subscribing to free Web-based content in an open way, we expect it to follow the path to nowhere blazed by the Sony Reader. Actually the Kindle does support podcasting, although a bit indirectly. You can play any MP3 file on the Kindle or from an SD card. If you want all the features like fast forward, skip ahead, and skip back, you can get those by putting any MP3 in the Audible folder on either the Kindle or an SD card.